I could not get this to photography well, but it really is tasty! 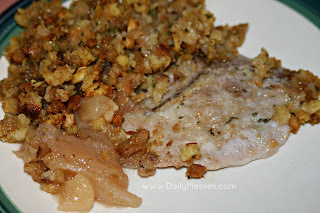 The sweetness of the apples, combined with the slight saltiness of the stuffing goes really well with the pork. It's always a big hit in our house. Prep: 10 min., Total time: 50 min. Serves 6. Prepare stuffing according to box directions. Spray a 13x9 baking dish with cooking spray. Spread pie filling in the bottom of dish. Top with pork chops and stuffing. Cover with foil. Bake 30 minutes and then uncover. Bake another 10 minutes, or until pork chops are completely cooked (160 degrees F).